Stuffed with dried fruit, nuts and cheese, then drizzled in a delicate sauce, this dish is sure to delight. After butterflying the pork loin, season it with herb rub before adding fillings. Layer spinach leaves over pork, leaving about a half-inch of meat exposed on all edges. Add a mixture of apricots, blue cheese, walnuts and salads, again leaving a half-inch empty around the edges. Roll the filled pork loin, jelly roll style. Tie the rolled pork loin at intervals with kitchen twine, and place it cut side down in a baking dish. Preheat oven to 375 F. Lay flattened, butterflied pork loin on a cutting board with smooth side facing down. Cover with plastic wrap. Using a meat mallet or the bottom of a cast-iron skillet, pound the loin evenly to half-inch thickness. Mix the dried apricots, blue cheese, walnuts and shallots; set mixture aside. Combine all the herb rub ingredients; spread 1 tablespoon of the rub over the exposed surface of the pork loin. Cover with enough spinach so none of the meat is exposed, except a half inch around the edge. Firmly pat the dried apricot mixture over the spinach, again leaving a half-inch border around the edge. Roll up the pork loin, starting at one end and ending with the cut side down. Using kitchen twine, tie the roast at 1- to 1½-inch intervals. Place, cut side down, on an oiled baking pan; spread the remaining rub on the outside of the pork loin. Roast 45–60 minutes or until an instant-read thermometer (inserted into the meat, not the filling) registers 145 F. Let stand 15 minutes before slicing. Remove kitchen twine. In a saucepan over medium heat, heat the apricot sauce ingredients, stirring, until the mixture starts to boil, about 5–7 minutes. Keep warm until served. Reheat on low heat, adding 1 teaspoon of stock, if needed. Why use a meat thermometer? It measures the internal temperature of cooked meat and poultry to assure that a safe temperature has been reached and that harmful bacteria have been destroyed. A meat thermometer can be used for all foods, not just meat. As a guideline, refer to this basic food-cooking temperature chart. What’s the best way to toast nuts? Preheat oven to 375 F. Lay nuts on a baking sheet (lined with foil or parchment paper for easy clean-up). Roast nuts until they start to brown and smell toasted, 5 to 10 minutes. 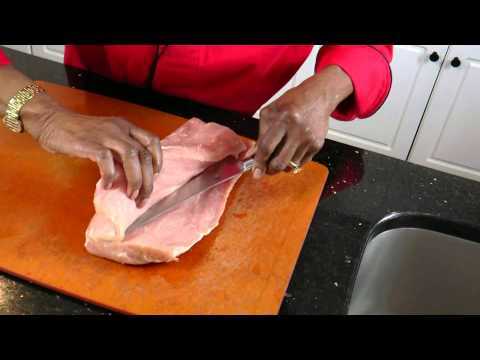 Butterfly a pork loin – Learn how to prep a pork loin for the fillings of your choice, then slice the stuffed-and-rolled roast into beautiful pinwheels.